Entrance aperture of a windowless graphite tube blackbody furnace at 2000 °C. Max Planck, a German physicist, gave a technical paper in December 1899 describing a theory that he developed to resolve the dilemma that had been confounding physicists for years. His hypothesis was that there were only a limited number of possible thermal radiation vibrations or frequencies inside any object. That theory was the start of what we call Quantum Physics today. He received the Nobel Prize in Physics for his achievement in 1918. A key element in Plank's theory (now called a 'Law of Physics') was a theoretical construct called a blackbody (black body). It had the unusual property of perfect absorption of electromagnetic radiation in the thermal region. Since it was perfectly absorbing, it could not reflect or transmit radiation. It had to be able to emit at the same rate at which it could absorb, or else it would source or sink all the radiant thermal energy in the universe. From an ideal came practical approximations, blackbody furnaces, that formed the foundation for the development of infrared thermometers, thermal imagers, radiometry and colorimetry. They provide the means to create reproducible, precision sources of thermal radiation of known radiation temperature. Laboratory blackbody (black body) furnaces approximate Max Planck's ideal. 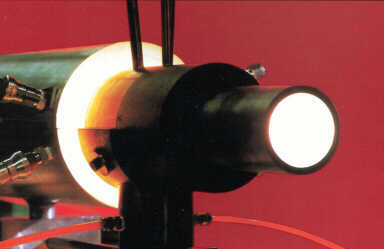 We strive to provide the closest approximation that a reasonable budget and the needs for precise sources of blackbody thermal radiation can provide.